Facebook has had outstanding financial results in 2016, however the stock has pulled back since Q3 results. Despite recent performance, investors may be wary of future growth prospects given the size of the company and ARPU challenges lying ahead. Facebook has been an aggressive acquirer and I believe it will be again in order to capitalize on the trend of monetized livestreaming. Peeks is a newly-released ecommerce enabled livestreaming platform that claims to be the only one of its kind with 100% in-house payment processing. After just three weeks of going live, Peeks has demonstrated the strength of its livestreaming and payment processing capabilities and has signed several agreements with large firms. Facebook, Inc. (FB) has had a strong 2016 by all accounts. Revenue is up 56% from the first nine months of 2015 and EPS has nearly tripled from $0.75 to $2.05 during that same time frame. Despite that, the stock has pulled back about 10% from the start of the month when Q3 financials were released. The bearish case on FB is that despite still being the leader in social media after all these years, despite the strong growth and despite an ARPU that is the envy of its rivals, its valuation metrics are stretched and user penetration is reaching the point of saturation. Facebook has a trailing Price to Earnings ratio of 45 and forward P/E of 22 which are justified by a PEG Ratio of 0.83 based on analyst expectations of a 35% average annual EPS growth rate over the next five years. For a company with an over $330 billion market cap, this is going to be a very challenging expectation to meet. Facebook must continue to acquire and innovate in order to maximize the monetization value of its massive user base and justify its valuation. Any investor should recognize Facebook's marvelous achievement of growing ARPU from $2.40 per quarter in Q3 2014 to $4.01 per quarter in Q3 2016. That, along with user base growth, has powered a more than doubling of revenue in a two year time span. 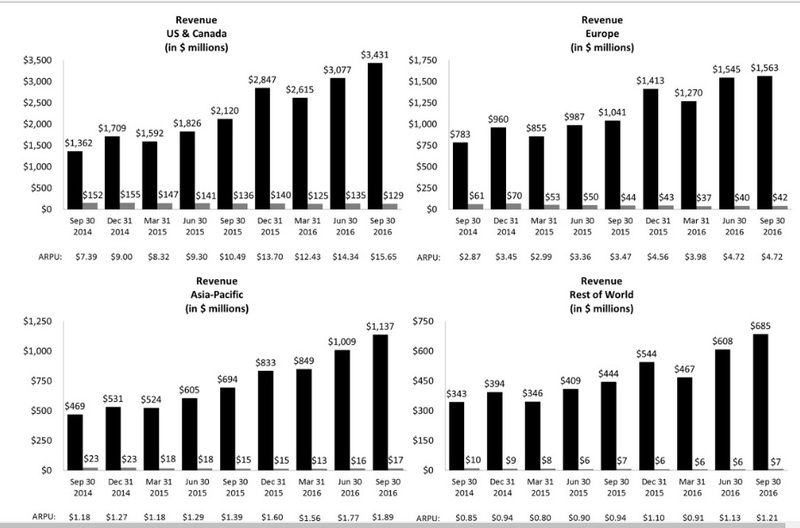 Impressive, since we are talking about numbers that grew from a little over $3 billion a quarter to $7 billion a quarter solely on the strength of ad revenue. While everyone can respect Facebook's outstanding growth, there are a couple of areas of concern of which investors should be aware. First, ARPU strength has been highly regionalized. The United States and Canada, which comprise roughly 5% of the world's population, make up about half of Facebook's revenue. ARPU in this region was $15.65 in Q3 2016, over four times higher than the rest of the world. Monthly active users in this region were 229 million for Q3 2016 and have consistently growth 2 to 3 million a quarter since 2014. The combined population of the U.S. and Canada is 360 million, meaning MAU penetration is already 63.6%. Pretty much everyone in these two countries who are going to use Facebook are already using it (outside of teenagers who will soon gain their independence), and I wouldn't put money on the extreme laggards being positive drivers of ARPU. As North America will make up a shrinking part of Facebook's revenue pie going forward, that will put pressure on global ARPU metrics. However, it also opens up a world of potential for the company to pull levers to increase its ARPU in these low-ARPU regions. "We enable Payments from people to purchase virtual and digital goods from our developers. People can transact and make payments on the Facebook website by using debit and credit cards, PayPal, mobile phone payments, gift cards, or other methods. We receive a fee from developers when people make purchases in these applications using our Payments infrastructure. We recognize revenue net of amounts remitted to our developers. We have mandated the use of our Payments infrastructure for game applications on Facebook, and fees related to Payments are generated almost exclusively from games. Our other fees revenue, which has not been significant in recent periods, consists primarily of revenue from the delivery of virtual reality platform devices and related platform sales, and our ad serving and measurement products." Worldwide payments revenue has dropped from 7.7% of overall revenue in Q3 2014 to 2.8% of overall revenue in Q3 2016. Payments ARPU has dropped from an already paltry 18 cents in Q3 2014 to just 11 cents in the past quarter. The extremely heavy reliance on advertising revenue and the to-date failure to monetize outside of that could be troublesome as users may eventually tire of the inundation of ads on their news feeds and other areas of the site. A purchase like Oculus VR (a deal that I supported) may have seemed out of the blue at the time, but the company is right to try to diversify its revenue stream while also capitalizing on being the hardware and content platform of a speculative future trend like virtual reality. 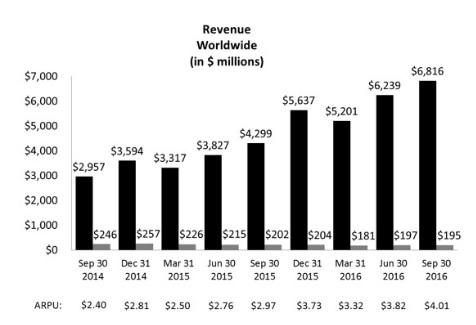 While payments revenue has been pathetic, the flip side to this is that not one of Facebook's 1.8 billion monthly active users are earning a penny for spending time on the site. Facebook has an absolute monster opportunity to monetize and pay its base for the massive amount of content and traffic that they generate. This is an opportunity that the company recognizes as it has started to explore new ways for users to profit from their posts on its network. There is one such opportunity that I think could lead to explosive revenue growth if it is pursued. "The biggest thing that I think we can take away from this as we invest in augmented reality in addition to virtual reality is that the phone is probably going to be the mainstream consumer platform [where] a lot of these AR features first become mainstream, rather than a glasses form factor that people will wear on their face." YouNow was the first social network that enabled users to broadcast live and has since introduced its partner program for eligible users. Viewers buy bars which can then be used to buy in-app gifts to "tip" content providers that they like. Those content generators are then able to redeem those gifts for real money. There are several platforms that run on this same basic premise, though YouNow appears to be the largest, claiming over 100 million monthly users. Busker is a platform that allows musicians to broadcast and viewers to tip them, with a recent feature addition that allows musicians to sell their merchandise to their fans as well. Both of these platforms, along with similar ones, charge a fee that usually ranges between 30% to 50% of the tips generated. Some of them may have advertising while others will not, but the main source of revenue for all of them is the fee generated from their cut of the tips. Not advertising revenue. Peeks, an ecommerce enabled livestreaming platform that is essentially 30% owned by Keek Inc. (KEEKF) (KEK.V) may be the best target of them all. What makes Peeks so special and why might Facebook be interested in the platform? First, I recommend that interested investors go to Peeks.com and download the app for themselves. As it has just been released to the world three weeks ago, the content generated by users so far might not yet be too stimulating, but the point is to get familiar with the technology that powers the high-quality live streams and built-in payment technology. It debuted on October 31 with a Halloween party. The party mostly featured B through Z-list celebrities babbling to each other for the first three hours before musical guests finally made it interesting for the final two, but the CEO was ecstatic that on the first night of going live, the app managed to handle a five-hour long, high-quality livestream from multiple cameras with no glitches. The purpose of the party was to prove the virility of the technology. The CEO of Peeks (as well as Keek and his private holding company Riavera and its subsidiary Personas), Mark Itwaru, has built a career in the payments processing industry and has spent nearly $20 million into the patented and patent-pending technology behind Peeks. What differentiates Peeks from YouNow (which uses Google or Apple to process its layered system of payments) and Busker (which uses Stripe), is that Peeks does not use a third party payment processor. The CEO has claimed that Peeks is the only app of its kind that handles all of its own transactions. That means 100% of the revenue is shared between Peeks and the individual users. Avoiding a third party payment processor would save hundreds of millions annually in charges for a company the size of Facebook that could generate billions in tips. Peeks also has a more liberal revenue sharing policy when compared to similar livestreaming platforms. For instance, while YouNow users must apply for eligibility into the partnership program, anyone using Peeks can start earning tips and cashing out as long as they have provided legitimate banking information. I believe that this is a huge policy advantage that will attract users from around the world, but particularly from developing nations. Individuals posing as journalists may risk their lives to broadcast political unrest in their countries. When broadcasting on Facebook Live, Periscope or a monetized app in which the user is not an eligible partner, they don't get paid. They can always direct their users to a GoFundMe page using those other platforms, but this is not nearly as effective or efficient as Peeks' built-in tipping capability that is up to the viewers' discretion and saves the content provider the indignity of openly begging. Keek's legacy app had a very strong presence in the Middle East. Now that it has merged with Peeks, Peeks has inherited that presence. Keek.com redirects to k.to which features Peeks Video. According to its Alexa rankings, k.to is already in the top 5,000 of most visited sites in Saudi Arabia after just three weeks of existence. The second strongest ranking country is Egypt, ranking just outside of the top 30,000 sites. So coupling the efficient tipping method with Keek's popularity makes Peeks very appealing to people in developing nations, an area of the world where Facebook's revenue badly lags and will continue to badly lag if it relies solely on advertising revenue. Advertising in these regions earn a much lower rate than in North America. With all that being said, Facebook could develop its own "tipping jar" and apply it to Facebook Live. It could also have developed its own Instagram or in-house VR headset if it wanted to. The company is not afraid to throw around billions for a company when it believes it can either monetize its large user base or leverage its technology. The question then becomes would Facebook be more compelled to look at something like YouNow which has a significant user base already, or something like Peeks where the user base is small at the moment (though growing at 6,000 users a day) but has the built-in payment technology? I believe the latter would be the wiser choice. Under the buyout scenario, Facebook could redirect any livestreaming traffic to Peeks that would be driven by the incentive to generate tips. A YouNow acquisition would likely go in the opposite direction where Facebook tries to integrate it with its own payment processing system. Given Facebook's large and growing network of advertisers and diverse mediums in which to display ads compared to its relatively small and stagnant payments division, I am not so sure that the company has fostered the culture where monetization of livestreams would be an easy task to complete internally. Much of the company's best resources would have gone to maximizing ad revenue so far, and for good reason. But a mind like Mark Itwaru's might be exactly what the company needs to kickstart a massive growth in content-generated revenue. As I mentioned above, Peeks is essentially 30% owned by Keek through a Technology Platform Licensing Agreement between itself and Personas, the private holding company of CEO Mark Itwaru who owns the intellectual property behind Peeks. I have written several blogs on Keek since September 22 on Seeking Alpha that which I recommend investors who are unfamiliar with Keek read. Trading in OTC and TSX Venture-listed stocks like KEEKF will be volatile and risky, but I believe that I have captured the major risks and opportunities in my post titled "Peeks: A Summary Of My Expectations, Opportunities And Risks", which includes an assessment of the state of the company's financials. I held an interview with Keek's CEO in my post titled "Twelve Questions With Peeks Creator And CEO Mark Itwaru" along with a short follow up interview in my post titled "Two Additional Questions With Peeks Creator And CEO Mark Itwaru". I strongly recommend that interested investors at least read these three posts if not my entire library of posts on the company. As I mentioned above, Peeks went live with its full version on Halloween night. In the three weeks since then, it has already signed an agreement with Warner Bros. Records where it will showcase emerging artists. It has procured the broadcasting and monetization rights to over 500,000 short form videos and over 1,000 daily videos including content from media industry leaders such as National Geographic, Reuters, CBC, Road & Track, HollyScoop, CelebWire, Seventeen, Esquire and MakerStudios. After those two deals were already announced, Peeks engaged Los Angeles based PMBC Group to lead its product marketing and media initiatives, so investors can expect the agreements made with large players to continue. While my hypothesis in this article is that Peeks, and thus Keek by extension, is a buyout target of Facebook, I am actually in no rush to see it happen. Management has forecasted only a $150,000 to $175,000 monthly burn rate on Keek as Personas has taken on three times as much of the costs. So if Keek is taking 30% of the revenue and only 25% of the cost, Keek shareholders benefit from having the company stay public for as long as possible. Keek will actually be profitable thanks to its stake in Peeks before Personas' stake in Peeks becomes profitable. And considering that the monetization model has been in place since day one, I don't expect it to be too long before profits are had. Why would the CEO do this? As he stated in my follow up interview with him, he wants the public listing to do well because it is a reflection of his overall value. If Keek, and its 30% stake in Peeks is valued at a $300 million market cap, for instance, that would imply a total valuation of $1 billion for Peeks and Personas' 70% stake would be worth $700 million. In addition to being the CEO, Mark Itwaru owns about 35% of Keek on a fully diluted basis. I believe that I have stated a fair case for an investment thesis in which risk-tolerant investors can use as a basis for their own due diligence on Keek. I remain confident that Keek will continue to run and I believe that anyone interested in a growing social media play that has had a proven monetization model from day one will agree with me. Whether that results in Facebook sniffing around in order to enhance its ARPU, another company kicking the tires or Peeks going at it alone, all scenarios should lead to a lucrative outcome for Keek shareholders. As for Facebook shareholders, I think it is prudent to expect the company to start diversifying revenues. A tipping jar on its livestream and post content that is then shared between the company and the users that generate the content is very low-hanging fruit that the company absolutely needs to be taking advantage of if it wants to continue its high growth trajectory. Expect an acquisition in order to facilitate this opportunity. Disclaimer: The author is long KEK on the Toronto Venture Exchange and retains the right to buy or sell Keek securities at any time. This article is for informational purposes only and the author does not guarantee its accuracy or completeness. It is not meant to be a recommendation to buy or to sell securities nor an offer to buy or sell securities. The author is not a broker, dealer or registered investment advisor and is not attempting nor intending to influence the purchase or sale of any security. There was some big news on one of my old plays, Mobio Technologies. Mike Edwards has stepped down as CEO, to be replaced by Laurie Baggio. While I still hold the stock at a substantial loss, PKK has more than made up for it so I consider it to be a sunk cost lottery ticket. "Will the new CEO be continuing with Strutta? Resurrecting Mobio Insider? Or going in a totally different direction? Maybe more than one of those options?" Mike Edwards made some pretty bold statements given how MBO has performed, speaking of building for retirement and parking some alpha in this stock. I appreciate his frankness about this being a LONG term play. It will probably take 5-7 years for MBO to see its split-adjusted high again, and that is assuming execution as planned. Laurie Baggio appears to be the right person to try to grow Strutta. The major issue is that there is substantial dilution associated with this deal. However, I think this will be like what has happened with Keek, where the new investors/management team will take control of a majority stake in the company. And good things appear to be happening with KEK with an app launch today. Mike Edwards is down a lot on this investment, as much as anyone else, and I think he is stubborn enough to participate in the private placement along with Baggio and any of his business associates. MBO went up a bit today so this news has been received positively. However, with such a small float and thin trading, it likely doesn't mean too much until they lay out a new plan. Calling this a long-term play shouldn't excuse the company from communicating with shareholders. I continue to hold MBO. At such a low price there's nothing much to lose while the CEO change could be the turning point for the company. As promised, I have followed up and finally made contact with someone representing Spackman Equities Group (SQG). He is John Pennal, Director & Vice President. You can contact Mr. Pennal at the contact information linked here. 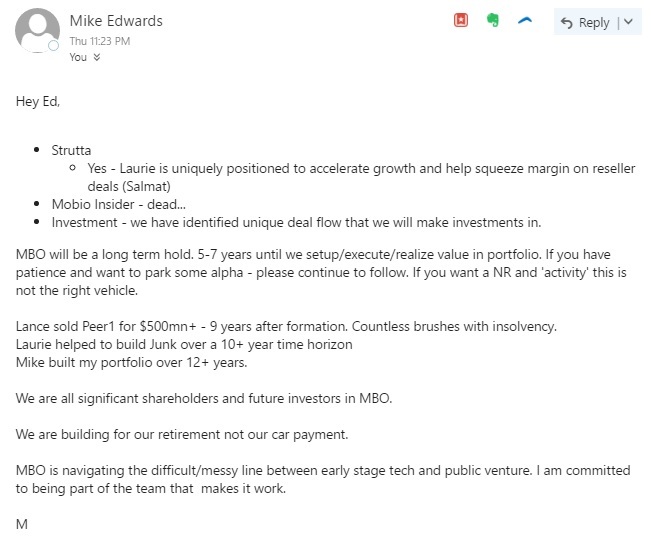 I encourage shareholders to get into contact with him personally, but I will share what he said during our email conversation over the past couple of days. "I am an investor in Spackman Equities Group. I estimate that SQG trades at over 75% discount to its NAV when considering the market price of Spackman Entertainment Group (40E.SI) of 13 cents SGD. While I have seen some funds get discounted up to 50% from their NAV due to holding illiquid securities, 40E.SI trades tens of millions of shares a day. I see no reason why there should be such a steep discount considering the company has some options at its disposal such as initiating a stock repurchase plan funded by using liquid capital. I appreciate the hard work that the Spackman team has undertaken to get 40E lively again over the past few months. But as a Canadian I feel left out from participating in this success. 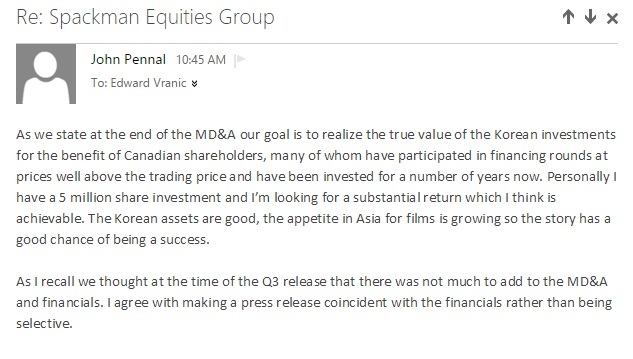 Since you appear to be the lead Canadian contact I was wondering if you have had any recent discussion with Charles Spackman for plans surrounding SQG above and beyond the focus on Spackman Entertainment. SQG played a significant role in 40E's successful IPO. The TSX Venture has been a disaster and I suspect that has played the major role in SQG being overlooked but I believe a focus back on this stock will lead to to substantial price improvement. Please reply with your comments at earliest convenience." "Another question, up until the Q2 report, SQG reported earnings through a press release, including up to date NAV. At the time 40E was dropping so the NAV looked bad and it played a role in the dropping stock price. The NAV at the end of November, as reported on the Q3 MD&A was 16 cents, but there was no press release. Why was that? Do you plan on issuing press releases for earnings going forward? With 40E year-end stock price being 14 cents and remaining steady in that area and aided by the tanking Canadian dollar vs the SGD, both NAV and Q4 financials should look pretty good, worthy of a press release in my opinion." Overall I am pleased with his responses. 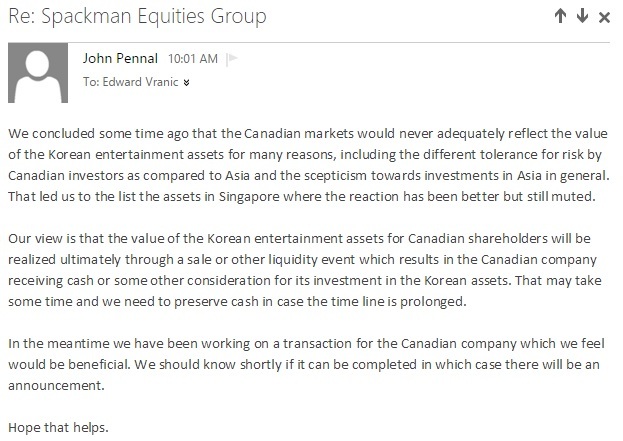 It shows that Spackman's management team is working behind the scenes and have not forgotten about Canadian shareholders despite the current appearance. Let's hope whatever transaction they have for SQG gets completed. SQG trades at such a heavy discount that I think whatever they end up doing will be beneficial for those who have purchased shares recently such as myself. As promised about a month ago, I have released an article on Eurocontrol Techniques. I believe a reasonable price target is $0.55. Last week, I had a phone conversation with the CEO of Eurocontrol Technics (EUO), Bruce Rowlands for the first time. I had contacted him through email several months before, asking for some clarification on the company's recently completed deal to sell its GFI subsidiary to SICPA. The phone conversation lasted well beyond what I had expected. I was on the phone with him for about 70 minutes, and I would estimate over 60 of those minutes was him talking. I am in the preliminary stages of my research on EUO, so I'm not ready to disclose a target on the stock just yet. But the stock is trading at less than its cash value and has a relationship with SICPA, so let's just say I think it is a buy. I plan to release an article on EUO in the next month. Expect it to be of similar quality as my articles on PKK. I own shares in EUO. A question that I got on more than one occasion from people is why would Mr. Jiang Wang be so willing to give up half of his business to list with Peak? Now there are a bunch of soft cushy answers I could give behind managing the stock symbol and getting listed on the NASDAQ, but I am going to focus purely on the math behind this deal so people can understand that this deal makes good sense from his perspective under most circumstances. Recall that he gets 199 million shares at a price of 2 cents and 199 million warrants at a strike of 5 cents. Assuming the warrants get exercised, he will own 398 million shares at a total cost of $13.93 million. If the stock price was to hit $1, the total value of his holding would be $398 million and he would have made $384.07 million on this investment. With the stock price at 7 cents, he has made $10 million on paper just on the share component of the deal and he hasn't even transferred over anything yet, so early indications are very positive for him. What does he have to give up to get a stock price of $1? Now let's ignore all growth initiatives that Peak is planning with the "Plastic Bank" (which we know will eventually be a platform for much more than just plastic) and any international expansion. Let's assume that the $1 stock price will only come through the transfer of existing business. Also for the sake of simplicity, let's ignore LongKey. To justify a $1 stock price, and assuming a fully diluted share count of 700 million, a 10 Price-Earnings ratio and a 15% growth rate, Mr. Wang would have to give up business worth $70 million in net income. Keep in mind this is only a mathematical example being used to demonstrate his motivation. Recall that Peak has disclosed that it will receive business worth about $100 million in revenue during the year, with no disclosure on net profits as of yet. Using a 10% discount rate, that would lead to an NPV of $348.45 million. Using the same 10% discount on the $384.07 million in investment gains to bring it forward one year (assuming PKK hits $1 in one year's time after the transfer in this example) would lead to a marginally better NPV of $349.15 million. Capital gains are generally taxed at lower rates than personal net income, but I don't know enough about the existing corporate structure of his conglomerate nor about Chinese tax law to make a definitive statement that he will win on taxes. I also make the very simplistic assumption that he would be willing and able to sell his shares at any time (though this is dubious considering his long-term vision). One could argue that I should be using a perpetual growth model instead of a 5-year NPV, but my response to that would be that this business can reasonably be expected to be worth well more than $1 per share beyond 2020 if its successfully executed and properly valued. So the two ever-growing impacts would offset each other as time went on. Now we know from my previous articles that Peak management and Mr. Wang are optimistic that PKK can reach $1, possibly within a year. And probably not with as much as $70 million in net income needing to be transferred over to the subsidiary considering that the current plan is for Peak to take over about $100 million in revenue which I'm sure is not at a 70% margin. So if Mr. Wang transfers considerably less than $70 million in net income and PKK can achieve $1, then he is a big winner. If on the other hand Mr. Wang transfers $70 million in net income and PKK fails to reach $1 within a year, then he ends up losing. Much of this business plan is hinged upon Peak management getting the word out and ensuring a favourable valuation. If they do a really great job and the plastic bank idea is seen as a comparable to Alibaba and gets a 20 P/E or greater valuation attached to it, then everybody wins substantially - shareholders, Mr. Wang and PKK management. If PKK does just okay and achieves a 10 P/E valuation, Mr Wang is about breakeven and will very likely continue forward in hopes the business gets more respect as it develops. However, if the idea struggles to gain traction and stock is valued more like Chinese industrials at a 5 P/E or less, then even a 10 cent EPS will lead to only a 50 cent share price. Shareholders still win, at least the ones who are in at today's price but Mr. Wang does not. He may take this as a temporary headwind and push forward, or may give up on the idea. Only he knows how much his tolerance is for potential short term losses in order to see out his vision. So the conclusion is that under normal circumstances and even fairly conservative circumstances, Mr. Wang can win on this deal. However, in very bad circumstances where the valuation is low, he can lose. That's why it is important for Peak to manage the investor relations side of the business carefully and why Mr. Wang has such an incentive to come to Canada to meet with investors and get them excited about his vision. He is taking a calculated risk that will very likely be profitable for him, but not 100% assured. In the worst case scenario the business he gives up will be worth more than the value of his Peak shares. I believe everyone will work hard to ensure that does not happen. Referring to my previous article on Mr. Jiang Wang's interview regarding his investment into Peak Positioning Technologies. Upon review of the article, Johnson Joseph, CEO of Peak had few suggested changes. So I was proud of myself that I managed to get everything just about correct when scrambling to write notes during the hour long interview. One thing that changed significantly though, was the title. I was going to go with the mundane "An Interview With the Investor Behind The Peak Transaction". It was actually upon his and Golden Qiu's advice that I changed it to the title you see. Why? Because they expect that this article will make its way back to China. They want his name in the title to attract interest as Mr. Wang is a highly respected business man there. I didn't discuss this with them, but I can only assume one thing. It doesn't take a genius to figure this out either. They expect significant Chinese investor interest. I don't know if they intend to promote there or if they will just passively let Mr. Wang's name behind it do all the talking. I don't know how easily PKK.C can trade internationally. So I would watch for a spike in volume on PKKFF. Hopefully everyone who is reading this article is familiar with the investment opportunity of Peak Positioning Technologies Inc. (PKKFF) (PKK.C). If not, please have a look at my article "To Be Valued Beyond A Penny Stock, A Company Must Behave Like A Large Cap" for an introduction. 1. Myself, the financial reporter. 2. Johnson Joseph, CEO of Peak, acting as the moderator to the call. 3. Liang "Golden" Qiu, CTO of LongKey (but there on his own behalf, not as part of LongKey), acting as the translator. 4. Jiang Wang, pictured above, Owner of ZHWY Enterprises and the strategic investor behind the "Banlan" deal, who was the subject of the interview. The purpose of this interview was to introduce Mr. Wang to the North American investment community. It will help to clarify Mr. Wang's vision to Peak investors. Peak has previously reported that this deal was involving Banlan, however, it has morphed into something much greater than that (as such, going forward, Peak will disassociate the investment and the "plastic bank" initiative from the Banlan name). I have a 20-cent target on PKK and will keep that target until the stock reaches that price and at that time I will re-evaluate. However, the other three participants in the call all believe the stock price will be much higher than that in a year's time, and have provided substantial evidence and a grand vision to support that belief. This interview was held over Skype starting at 9am Eastern Standard Time on January 13th, which means it was held at 10pm local time for Mr. Qiu and Mr. Wang. The video conferencing lasted only the first few minutes before connectivity issues made us migrate to a voice-only Skype call, but I was able to see employees in the office on standby to take pictures of the two while in the office. This should be an indication of how important this deal is to Mr. Wang. He stayed in the office along with several other employees and invited Mr. Qiu until 11pm just to conduct an interview with me during North American business hours so that Canadian (and U.S.) investors got to know him. This is not some one-off "fun money" speculative investment by some overseas billionaire. This is an investment made by a man who is actively and seriously trying to grow his business internationally and has decided to use Peak as a method to achieve his goals. This will be the prime focus of his time going forward. This will be a "paraphrased" interview as Mr. Qiu had to translate everything Mr. Wang said into English. Although it's not reported on a word-for-word basis, I can confirm that Mr Qiu, Mr. Wang and Mr. Joseph have reviewed the content of this article before publishing and they can reassure you that the spirit of what I have written is accurate. I asked 15 questions which can be broadly divided into four sections. About Mr. Wang, his vision for his business, his views around Peak and the partnership and ways to reassure North American investors about this venture. I will occasionally add my own comments in, prefaced with an E.
Q. What is your background (where you grew up, your educational and professional background)? A. Mr. Wang graduated from the Central University of Finance and Economics [CUFE], and as the name implies, it's an institution that specializes in finance and economics. He has been employed by various banks and worked his way up to becoming a Vice-President. Fifteen years ago he started his own investments in finance, at a time when the economic and political atmosphere in China was very lucrative to do so. 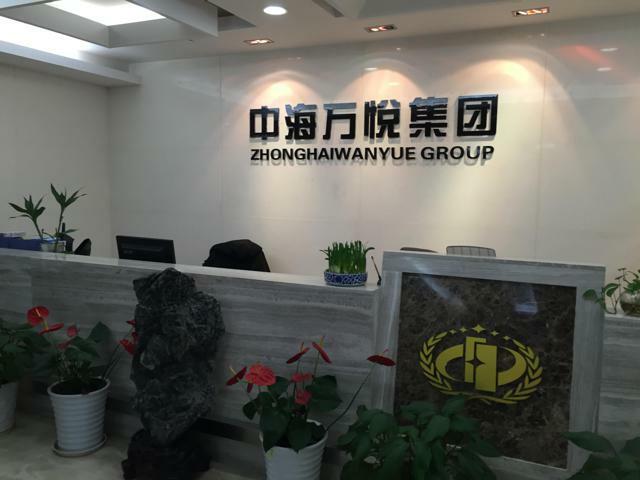 A couple of years ago he decided to group his investments, including Banlan, into ZHWY (Zhonghai Wanyue) Enterprises, of which he is a near-100% owner. It is a conglomerate that focuses on financing and investing in the logistics of bulk goods like plastic and steel, eCommerce, new energy and environmental initiatives. Q. How have you built yourself into the successful businessman you are today? A. While working in the banking industry, he made many valuable contacts. China was booming economically at the turn of the century, but the notion of private investment was fairly new. The existing model at the time for a government-run project was one where it bought the equipment and outsourced the labour. Mr. Wang was a proponent of the EEPC Business Model, a process chain whereby he offered project managers turnkey solutions. His company would help the owner raise financing, lead the project's design and operate it. This model proved to be a huge success in China and Mr. Wang was able to procure a lot of business. Q. We know about you because of your investment in Banlan. But we now understand that you have many other companies and projects. Can you give us a summary of them? A. ZHWY is a conglomerate of 29 different companies. In addition, Mr. Wang has an investment in eight other businesses. His companies focus on his areas of expertise - offering financing and supply chain solutions - for a variety of industries. He is an 85% owner in JP Syndicate Ltd., a company which operates nearly all the environment-related projects in Shanghai. For instance, it procured the waste water processing center contract for the city from the government. The company is in charge of the design, financing and operations of the project. He has also recently partnered with German interests to develop an electric car company called Dedian Electric Auto Ltd.
Q. How have your companies fared recently as China is going through a rough patch economically? A. Challenges and opportunities exist in all sorts of economic climates. For instance, the price of oil dropping has led to substantial cost savings for Banlan. But the trading of bulk goods is tighter. Companies always have financial service needs, during good and bad economic times. He believes that modernizing the process by which he is able to provide financial services to companies will be an outstanding growth business in boom times and bust. Q. What would you say is the estimated combined value of all of your businesses? Q. What specific opportunities do you see for the plastic bank? Q. You've been very successful as a business man in China, what is your motivation for desiring to list in North America with Peak? Do you intend to expand your businesses internationally? A. Mr. Wang intends to use offline assets such as factories, buildings and inventory to create a foundation for his business plan. These assets will be used to build the online platform and expand the financial services of the target industries. He eventually wants to settle on one platform in the future (E. reminds me of Alibaba again) that evolves into a few verticals and includes international trade. He stressed that getting international and younger people (E. I assume as employees, management and investors) with an interest in eCommerce involved in the business was a key part of this vision. Mr. Wang specifically partnered with Peak because it is an investment holding company. He called Peak a "mini-me" that has a deep understanding of the business model that he has with ZHWY Enterprises and wishes to expand upon with his vision. He stressed that Peak management is a very important ally for him to go international. Q. Where do you hope to see Peak, specifically Peak's stock price next year? In five years? A. By 2017, Mr. Wang expects to move a substantial amount of existing business from "offline" to "online" through the subsidiary set up under Peak. While prefacing that his vision is focused on the long-term success of the business over the short term stock price movements, he expects that in 2017 the stock will be listed on the TSX big board and trade in the $2-$3 range. (E. The goal is without a reverse split, so think in terms of a market cap in the hundreds of millions and up to two billion dollars). 2020 is much further out so it's difficult for him to guess on a stock price, but he expects that the stock will be listed on the NASDAQ or NYSE. There will be numerous businesses housed under the Peak subsidiary. The growth and international exposure of the business will allow him to achieve his goal of gaining access to new projects worldwide which will also be a part of Peak. Q. What do you believe Peak management bring to this business relationship that will help you reach your goals? A. Just like Peak management had to do their due diligence on Banlan (which eventually led straight to Banlan's owner), Mr. Wang did his due diligence on Peak. Mr. Qiu was the key intermediary here as he has known Mr. Joseph and other members of Peak's management team for many years. Mr. Wang reiterated that after the initial deal (as described in the December 1, 2015 press release) is closed, the plan is to put more resources into Peak and to hire more people to help run the international aspect of the business plan. Q. When do you expect to be able to send the $4M investment to Peak to make the partnership official? A. The transfer of funds for the remaining $3.9 million will be completed by the end of January as agreed with Peak. The reason behind the transfer not being completed sooner is that is takes a few days to complete the required paperwork before funds transfer process can be completed (some of which will be outflows to Canada and outflows to Canadian dollars) per Chinese government regulations. Q. When do you expect the plastic bank to begin to operate and when can investors start to see revenues come from its operations? A. The platform will be online by the end of Q1 and revenues will start to flow in Q2. The development of the plastic bank platform actually started in June 2015. Q. Other than the plastic bank project and the distribution of plastic raw materials, are you planning on having some of your other projects and companies run through Peak to increase Peak's revenues in the future? A. Already touched upon earlier, but yes, the intent is to have other bulk goods like rice and steel running through the platform in addition to plastic. Q. Peak's management has plans to see the stock listed on the TSX big board by the end of 2017 and eventually listed on the NASDAQ by the end of 2018. Do you share that vision? A. Yes, again touched on before (E. apologies for not having the improvisation skills to change my pre-set questions on the fly while taking notes). When Mr. Joseph came to meet Jiatao Luo, the chairman of Banlan, he originally believed the deal was solely for the plastic bank. Since then, Mr. Wang has pushed the vision of moving the transactions of many bulk products from offline to online, not just plastic. Mr. Joseph is obviously on board and thrilled with this expanded vision. Mr. Wang reiterated that revenue flowing through the subsidiary will not be a problem. It will just be a matter of how fast the transactions can be moved from offline to online and therefore into the subsidiary. Q. North American investors have lost money in the past by investing in Chinese-North American partnerships. So it's very important to let these investors know that this Peak partnership is with a reputable and respected businessman. What would you say about yourself and the partnership with Peak to reassure investors that this will be a very successful partnership? A. This transaction will occur within Chinese and Canadian laws. The operations and financial statements will be audited both on the Chinese and Canadian ends of the company through Grant Thornton LLP. Mr. Wang reiterated that he has been in business for 20 years and that his reputation is very valuable to him and his business. He will do what it takes to achieve his goals and deliver on his promises. He also finds the value in a steady flow of news releases, communication and transparency between Peak and its investors. Q. I'm sure some of Peak's investors would like to have the opportunity to meet you. Are you planning to travel to Canada in the future to visit Peak and possibly meet some of Peak's investors? A. Yes, Mr. Wang plans to travel to Canada in March or April. 1. His vision of an international online bulk trading platform which sounded to me like the Alibaba of the industry. 2. His estimation that the stock price will be $2 to $3 next year. Like I said, this implies that Peak will be up to $2 billion in market cap assuming a fully diluted share count of 700 million inclusive of all warrants being exercised. That's an unbelievable run under any set of circumstances and investors should be cognizant of the difficulty of such an achievement before letting their heads go into the clouds. However, ZHWY Enterprises is worth an estimated 50 billion RMB. Mr. Wang certainly has the firepower to make it happen. I think of a story like Martin Shkreli. The mere mention of him investing in KaloBios Pharmaceuticals, Inc. (KBIO) caused the stock to go from $2 to $45 in days before it crashed again after his arrest on charges of security fraud. If the mere investment from a man like him causes a stock to run 2,000% before he even does anything with it, why shouldn't an investment from a man with high integrity like Jiang Wang, someone with even greater wealth and a very specific plan, do the same for Peak in a reasonable time frame like a year? 3. Mr. Wang calling Peak a "mini-me" was particularly striking to me. Above and beyond the important business contact made possible through Mr. Qiu, this Peak deal makes a lot more sense. Mr. Wang likes Peak because he sees in the company a smaller version of his business. Mr. Wang calling Peak a mini-me means he thinks the management team has the same mindset as him. I cannot overstate how important it is that Peak and Mr. Wang are on the same page, and it sounds like they are. I reiterate that I will not change my 20 cent price target on PKK until it reaches that price level and I can revise it upwards at that time. It's always better to be conservative than too aggressive. I always thought that Mr. Joseph's $1 target was a "dream big" type of goal. However, I must admit after conducting this interview, I can see a very clear path that would justify a $1 or greater stock price. I would just prefer to reach that conclusion in stages. Investors are free to come to their own conclusions, but I would not sell a substantial portion (greater than 10%) of my shares at 20 cents if it were to hit that target tomorrow.